Homer is a free cross-platform video conferencing software. It supports an unlimited amount of simultaneous live video/audio chats. Movies as well as music files can be presented during a conference. The software supports low quality as well as high quality audio and video transmissions. 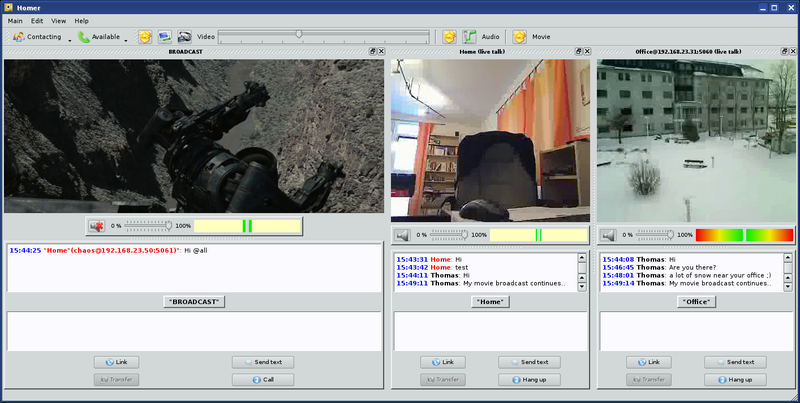 Homer can also be used to remotely observe the activites on a desktop screen. For all these tasks the software doesn't need a server infrastructure but it supports SIP servers as well. Couldn't even test it, how can you add/invite people? Why make it so complicated? Simple is good.